7. Emperor Aśoka - royal patron of Third Buddhist Council, propagating Buddhist Missionary to 9 places and constructed many nationwide Buddhist Monuments (including the famous Rock Edicts). King Bimbisāra was the friend of King Suddhodana and whose kingdom the Bodhisattva Prince (Siddhattha) went on alms-round. He was a religious king and a very staunch supporter of Buddhism. When he heard the Buddha preached the Dhamma he became a Sotāpanna. He told the Buddha that his five wishes which he had cherished life-long until then had been fulfilled. With great joy and devotion he donated his royal park together with the famous Veluvana monastery also known as the Bamboo Grove. The Buddha spent five Rains Retreats (Vassana) in this monastery. King Bimbisāra spent his last days in a royal prison because of the misled rebellious and unfilial son Prince Ajātasattu. After his death he was reborn in the Heaven of the Four Guardian Gods (Cātumahārājika Devaloka) as he had a host of friends waiting for him there. Anāthapiṇḍika, the feeder of the helpless, was a millionaire in Sāvatthi and Sudatta was his family name. He met the Buddha when visiting his brother-in-law who was staying in Rājagaha. With untold joy he learned that the Buddha was living in a nearby park. In his intense desire to meet the Buddha, he woke up very early and proceeded towards His residence passing through a cemetery. So great was his faith in the Buddha that a light emanated from him. Guided by this and also by an unseen being, he reached Sitavana where the Buddha was strolling up and down anticipating his visit. Summoned by the Buddha who used his family name, he went up to Him, paid his respects and sat down to one side. He then heard the Buddha’s preaching and became a Sotāpanna. Returning home to Sāvatthi he bought a park belonging to Prince Jeta by covering the whole area with gold coins and built the famous Jetavana Monastery. In this monastery the Buddha spent 19 Rain-Retreats where He expounded many sermons, much to the delight of the numerous monks, devotees and deities who attained various stages of sainthood in the Ariyan Truth. Puṇṇa Lakkhaṇa was his wife and he had three virtuous daughters named Maha Subhadda, Cūḷa Subhadda and Sumana. The eldest was a Sotāpanna whilst the youngest was a Sakadāgāmi. His only son Kāla was not a devout Buddhist at first but through the skilful guidance of his father he later attained Sotāpanna. Anāthapiṇḍika passed away after hearing a discourse from the Venerable Sāriputta, the First Chief Male Disciple of the Buddha. After death he was reborn in Tusita Heaven but came back that very night to visit the Buddha, extolling the virtues of the Venerable Sāriputta and also expressing his pleasure on seeing the Buddha and His disciples residing at his monastery. The Lady Visākha was not only distinguished but also a very touching person, filled with tender care. She was the daughter of a millionaire father Dhananjaya and Sumana was her mother. Her beloved grandfather was also a millionaire named Meṇḍaka. At her young age she was spiritually very advanced and attained Sotāpanna (the first stage Noble Sainthood) on hearing only for the first time the Buddha preached Dhamma. Though endowed with all the angelic charms and great feminine beauty, Visākha had masculine strength, talented worldly wisdom and gifted insight. She was married to a non-Buddhist, named Puññavaḍḍhana, the son of a millionaire called Migāra. On her wedding day, a very large dowry and other precious jewellery were given to her. This rare and very expensive cloak was not only bedecked with special sparkling gems but also very heavy, so that only a very strong lady of masculine strength can wear it as an ordinary attire. On the eve of her wedding she was duly advised by her father on and about the domestic life she had to face in her father-in-law’s house. Through her tact and integrity, she eventually converted her husband’s household into a very happy Buddhist home. Her callous father-in-law was the first to attain Sotāpanna, making him reverse whatever bias and antagonism he had against Buddhism. He embraced Buddhism and thereafter Visākha was left free to continue her Buddhist activities as she liked. Prompted by the Buddha she built the Pubbarāma (monastery) in a place, east of Sāvatthi and donated this to the Buddha who spent 6 Rains Retreats (Vassana) there. Throughout her life she remained a devout and dedicated female supporter of the Buddha and His disciples. As a renowned lady, close to the Buddha, she was the centre of Buddhist activities and was even deputed by the Buddha to solve disputes which arose among the Bhikkhunīs (nuns). Some rules were promulgated for the Sangha at her suggestion. She was an immaculate and distinguished lady personified by her flawless conduct, noble manners, pleasant speech, caring for and reverential to elders and compassionate towards the less fortunate ones. With her impeccable and kind hospitality, she captured the hearts of all who knew her. Such a lady was Visākha who left behind fond memories in the hearts of many people in her time and the future generation. King Kosala Pasenadi, or simply King Kosala as he was more popularly known, was one of the royal supporters of the Buddha. As a close devotee he was a frequent royal visitor but he was usually portrayed as a jovial and carefree fat king, fond of good food and enjoyed easy life. Therefore a stringent religious life, struggling to attain higher spiritual levels was not his cup of tea. Fortunately for him, his slow-thinking devotional character was ideally compensated by his sharp and quick-witted Chief Consort, Queen Mallikā who managed most of his affairs and problems. It was because of his super-intelligent Queen that he was able to perform the once in the life-time unique Alms giving, which could take place only once in the lifetime of a Buddha. This was indeed a rare honour and in the Gotama Buddha sāsana was King Kosala Pasenadi, whom some believed to be a Bodhisattva (future Buddha-to be). The father-killing Prince was the son of King Bimbisāra, a righteous and noble King who donated his pleasure grove, the Veluvana, to the Buddha and His disciples. King Ajātasattu killed his father through the wrongful association with and advice of Devadatta, the arch-enemy of the Buddha. After the regrettable episode, King Ajātasattu became a very devoted and pious Buddhist. Therefore his committing patricide had completely blocked the noble entry into the Ariyan Stream, ever to helplessly suffer accordingly in the ocean of endless becoming. Intrinsically King Ajātasattu was a pious and dedicated devotee. When duly informed of the Sangha’s intention he immediately organized and set up the facility for the First Buddhist Council, of which he became the royal patron, to be held at the Satapaṇṇi Guha (Cave) in Rājagaha. In the 10th year of King Kalasoka's reign and 100 years after the demise of the Buddha the second Buddhist council was held at Vesālī. The highlight of this council was the Ten Unlawful Points claimed by many shameless Bhikkhus of the Vajji clan to be not unlawful. Upon hearing this, the Venerable Yasa approached the Venerable Revata who pronounced all of them as unlawful. When questioned, the most senior Arahant Venerable Sabbakāmi who was over one hundred years old, also pronounced them as being unlawful. After this the Venerable Revata chose seven hundred distinguished Arahants to hold a Council to purify and protect the Dhamma. 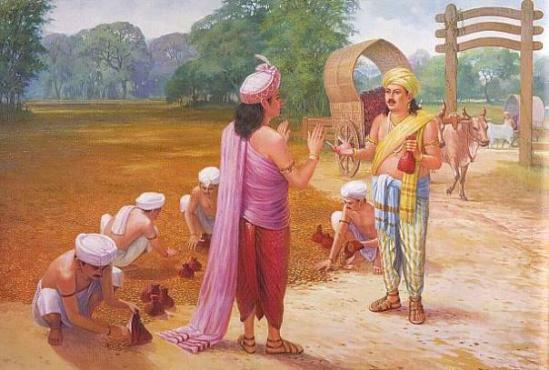 Thus the second Buddhist Council, in which King Kalasoka was the royal patron, lasted for seven months. It was held in 238 Maha Era (B.C. 443). Among the royal supporters of Buddhism Emperor Aśoka was (and still is) the most outstanding, a rare distinction without a comparison. “Heedfulness is the path to Deathless. While seated, he spoke from the Emperor’s throne. Although little was spoken the impact was tremendously great because it changed the great Emperor’s life and national and international destiny. From Caṇḍa-Aśoka which means Aśoka the Wicked, his name inevitably became Dhamma-Aśoka - Aśoka the Righteous, Devānām-priyā - Dear to the Gods, Piyadassi - Pleasant to Behold, and so on. Besides the erecting of thousands of rock edicts to immortalize and propagate Buddha’s teachings, the great emperor also set up many thousands of health and educational institutions for public use. An exemplary behaviour of a great and mighty person, not found today. He had everyone’s welfare in his heart and was a father to all. In brief he was an ideal Emperor who ruled perfectly in accordance with the Buddhist teachings. The third Buddhist Council was held at Aśokarama (now Patna) in the year 374 Maha Era 236 years after the demise of the Buddha. It lasted for 9 months and 1000 Arahants participated. The Venerable Moggaliputta Tissa was the presiding Thera. The Venerable Majjhantika and Mahādeva recited the Vinaya and the Dhamma respectively. Emperor Aśoka was the royal Patron in this august assembly. As stated briefly, these seven magnificent people made distinctive contribution and in their own way were the ideal supporters dedicated to Buddha and Buddhism. This made what Buddhism is today, simply practical and pristinely pure. Nothing more can be asked for!